aran nAraNan nAmam – as per samskritham etymology, “harathIthi hara:” one who destroys is known as hara: (another name for Siva). Thus, one person has as his name what he carries out as his profession [hara: is written as aran in thamizh]. When the world, which is created, engages in wrongful deeds and tries to ruin itself, sivan carries out that task after becoming a form (body) for emperumAn. Even though he carries out that task as a subordinate of emperumAn, he lives in samsAram (materialistic realm) which is to be destroyed. sivan’s position is like that of an official in a kingdom who has to pull down the decorative pandhal after mahAnavami [as part of navarAththiri or dussehra festival] on the orders of the King. The name of the other entity, is nArAyaNan, the emperumAn (as per etymology, he is the resting place for all indestructible entities (both sentient and insentient) and he has these entities as his dwelling place since he pervades them all). He has all the universes as his body and as his servitors and he is their Lord, ruling over them as their AthmA (in-dwelling soul of all souls). When someone gets hurt in his foot due to stepping on to a thorn, the pain is felt by the soul which dwells inside the body. In the same way, if people in this world suffer, emperumAn treats those sufferings as his own. Since he does not think that he could exist without them, he is called as nArAyaNan. An vidai puL Urdhi – if one were to look at the vehicles for sivan and nArAyaNan, similar differences will surface. sivan, in line with his cruel characteristic [of annihilation] has the bull as his vehicle [it is common parlance to call a person without knowledge as “aRivillAdha mAdu” (vidai is mAdu) While the word vidai also denotes lion, in order to distinguish it from bull, the prefix An has been added to vidai to denote bull. 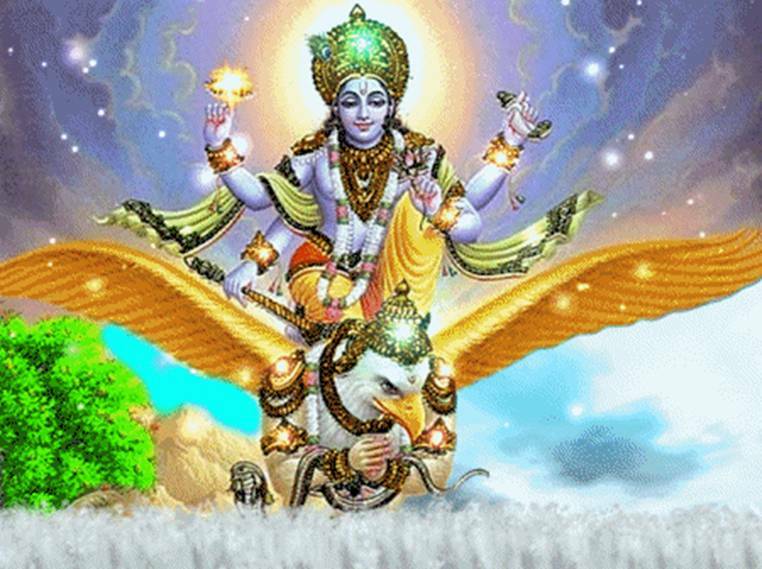 emperumAn, on the other hand, has as his vehicle garuda who is the embodiment of vEdham (sacred texts). This shows his greatness. urai nUl maRai – the authentic proofs that disclose these entities are also similar. urai is pramANam (authentic proof). This could be either nUl or maRai. Here, nUl refers to the Agamam that sivan narrated of himself when he was under thAmasa guNam (state of ignorance). For emperumAn, it is maRai (sacred text) which does not have the fault of having been written by a person and does not yield to the three guNas (thAmasa, rAjasa and sAthvika, which are ignorance, passion and purely good, respectively). uRaiyum kOyil varai nIr – their dwelling places are also of similar nature. For sivan, in line with his cruel nature [of annihilation] the dwelling place is the hardened [kailAsa] mountain while for emperumAn, in line with his cool and merciful nature, it is thiruppARkadal (the milky ocean). karumam azhippu aLippu – their deeds are also different. One [sivan] destroys all the worlds while the other protects the worlds by gently stroking with his divine hands. kaiyadhu vEl nEmi – the weapons on their hands will also be different. For sivan, the weapon is the destructive trident while for emperumAn, it is the protective thiruvAzhi (divine disc). thirumangai AzhwAr says in periya thirumadal “konnavilum vEl” (the trident kills) and nammAzhwAr says in thiruvAimozhi 2-10-6 “aRamuyal Azhi” (the disc establishes righteousness). That emperumAn holds weapons such as the disc is brought out by an event which happened in parAsara bhattar(kUraththAzhwAn’s son)’s time. A person by name nilAththukkuRip pagavar [an adhvaithi] asked of bhattar “is there any pramANam to show that emperumAn is with four hands (along with his divine weapons) in paramapadham [SrIvaikuNtam] too?” to which bhattar quoted mandOdhari in SrI rAmAyaNam yudhdha kANdam 114-115 “thamasa: paramO dhAthA Sanka chakra gadhAdhara:” (emperumAn is superior to thamas [thamas here refers to the end of prakruthi, the primordial nature]; he supports everything; he holds Sanka and chakra in his hands). pagavar became angry because he did not want to accept this. bhattar said “when pramANam is like this, what is the point in getting angry?”. uruvam eri kAr mEni onRu – uruvam is form. The forms are also quite varied for the two of them. One [sivan] is a burning form like fire while the other is like rain-bearing cloud. A person who is suffering from thApathrayam (AdhyAthmikam, Adhibhoudhikam and Adhidhaivikam) – illness caused by (a) one’s own wrong deeds, (b) by nature and c) by emperumAn – gets liberated from these but confronts such a burning form, he would think that his earlier state was better. The other is like the happiness that a person gets similar to [an agricultural] field expecting rain, which indeed receives that rain. thaiththiriya upanishath nArAyaNavalli 11 says “neelathOyatha madhyashthA vidhyullEkEva bhAsvarA” (like lightning amidst blue coloured clouds), thus describing emperumAn’s divine form. After “uruvam eri kAr”, AzhwAr says mEni onRu. One is sivan who is the SarIram (body) while the other is emperumAn who is the SarIri (the indwelling soul). yajur AraNyakam 3-11-21 says “antha:pravishtaSSAstha janAnAm sarvAthmA” (emperumAn pervades all janas (those who are born) and controls them). Thus is it clear that everyone is his body (form). Hence in the context of AzhwAr’s pAsuram, if one is body, the other has to be AthmA. We shall take up the 6th pAsuram next. This entry was posted in iyaRpA, mudhal thiruvandhAdhi on June 13, 2017 by T N Krishnan.